Greenies Grain Free Daily Dental Treats for Large Dogs are nutritionally balanced grain free treats for large breed dogs weighing over 23kg, to help promote fresh breath, clean teeth and a happy dog. Featuring a delightful chewy texture that helps reduce plaque and tartar as your dog chews, Greenies Dental Treats have also been made with soluble ingredients that are designed to easily break down for safe and easy digestion. 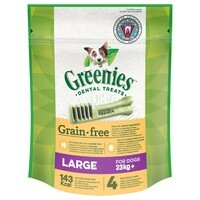 Irresistibly tasty and incredibly powerful, Greenies Grain Free Dental Treats are a healthy daily treat that your dog won’t be able to wait to sink their teeth in to.